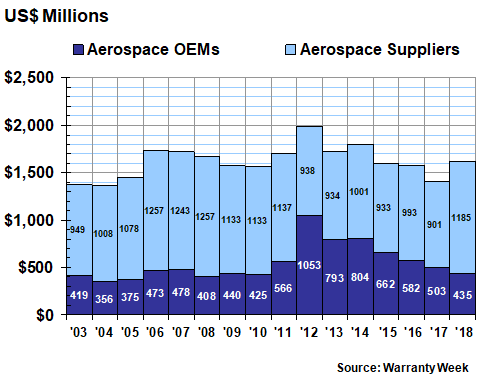 Claims and accruals continue to fall for the top aerospace OEMs, though the warranty expense rates of aerospace suppliers has been rising for two years now. And the recent acquisition of Rockwell Collins by United Technologies has made the industry's largest warranty provider even bigger. 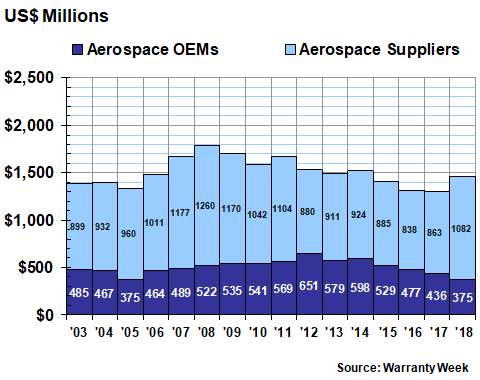 Since 2003, we have tracked 100 U.S.-based aerospace manufacturers and the warranty expenses they report. Most are primarily or exclusively engaged in the production of aircraft or parts and systems for aircraft, but some are borrowed from other industries such as telecom equipment, appliances, semiconductors, or automotive parts. We have divided the list of 100 companies into two pieces. First is a list of 10 OEMs such as Boeing Co., General Dynamics Corp., and Textron Inc. Second is a list of aerospace parts and component suppliers such as United Technologies Corp., Honeywell International Inc., Garmin Ltd., L-3 Technologies Inc., and Trimble Inc.
Not included is General Electric Co., which is a major jet engine manufacturer. Because each company reports just one set of warranty metrics for all its product lines, and because GE is such a large warranty provider (in 2018 it paid $960 million in claims), its inclusion would nearly double the entire industry's total warranty expenses. So we'll include GE in a future newsletter when we take a look at the power generating equipment industry. Also included is avionics manufacturer Rockwell Collins Inc., which United Technologies acquired late last year. In the future, United Technologies plans to spin off its HVAC and elevator businesses into separate companies, which will leave behind the avionics and jet engine lines of business. For each of these 100 companies, over the past 16 years, we have collected four essential metrics from each of their financial reports: the amount of claims paid, the amount of accruals made, the amount of warranty reserves held, and the amount of warranted product revenue. Using the claims, accruals, and sales figures, we have calculated an additional pair of percentages: the claims rate and the accrual rate. In Figure 1, we are taking the annual totals for claims paid for each of the past 16 years. In 2018, the aviation OEMs reported paying $375 million in claims, down $62 million or 14% from their 2017 totals. It was their fourth consecutive year of declining claims. Their suppliers paid $1.082 billion, up $220 million or 25%. Combined, their totals were $1.457 billion, up $158 million or 12% from the 2017 totals. 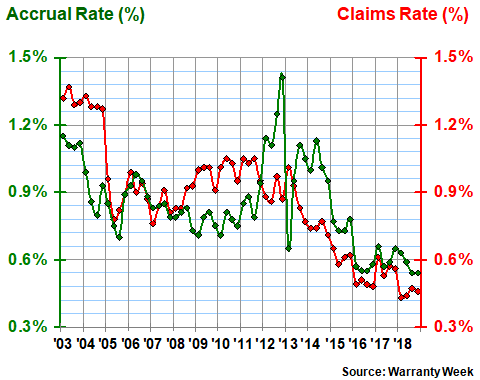 And that was the biggest annual jump in the industry's claims payments, in both dollar and percentage terms, since 2006-2007. Boeing led the decline in OEM claims, reporting $193 million in payments, down by 20% from 2017. With the recent news about the grounding of the 737 Max 8 and 9 fleets, that trend is likely to reverse itself in 2019, however. General Dynamics, which owns the Gulfstream Aerospace Corp., reported a 17% decline in claims payments last year. Textron, meanwhile, reported a 13% increase, though it did not specify whether that arose from its Bell Helicopter, Beechcraft, Hawker or Cessna aviation brands, or perhaps from one of the land-based vehicle brands such as Arctic Cat, Jacobsen, or E-Z-Go. On the supplier side, United Technologies reported a big acquisition-related jump in claims, while Rockwell Collins ceased reporting in the third quarter. Honeywell and L-3 Technologies both reported modest decreases, while Harris Corp. and Moog Inc. reported modest increases in claims payments. Trimble was down slightly while Garmin was up slightly. 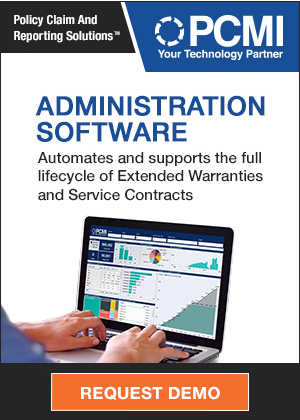 Our second warranty metric is the amount that manufacturers set aside as warranty accruals, which represents their best guess regarding the future cost of warranty. Normally, absent any predicted change in quality or product reliability, the amount of accruals remains more or less proportional to sales. Therefore, when accruals rise or fall at rates that are very different from sales, it signals that a company believes its product reliability and therefore its warranty costs are also going to change. In Figure 2, the OEMs set aside $68 million less in 2018 than they did in 2017, a 13% decline. And it was the fourth straight year of declines, after OEM accruals peaked at $1.053 billion in 2012. Their suppliers, meanwhile, set aside $1.185 billion in warranty accruals, a 32% increase from 2017 levels. It was the first time suppliers accrued more than $1 billion since 2014, though it was their 10th time they did so in the last 16 years. Sales increased for both groups: rising 4.7% for the OEMs and rising 5.9% for the suppliers. Therefore, accruals fell for the OEMs while sales rose, and accruals rose faster for the suppliers than did their sales totals. In other words, the OEMs were predicting a massive reduction in future warranty costs, while the suppliers were predicting a massive increase. Because it is now reporting for Rockwell Collins, United Technologies saw its accrual total soar from $323 million in 2017 to $604 million in 2018. Harris, FLIR Systems Inc., and Teledyne Technologies Inc. also reported large increases in accruals made, far in excess of any changes in product sales. Garmin, John Bean Technologies Corp., and Crane Company reported modest increases in accruals, but their sales rose faster. Meanwhile companies such as Trimble, Moog, L-3 Technologies, and Boeing reduced their accruals even as their sales rose. General Dynamics and Textron saw their sales fall, but cut their accruals by more. In other words, they are predicting lower warranty costs in the future. In Figures 3 and 4, we are taking the claims and accrual data from Figures 1 and 2 and comparing each of them to sales data. 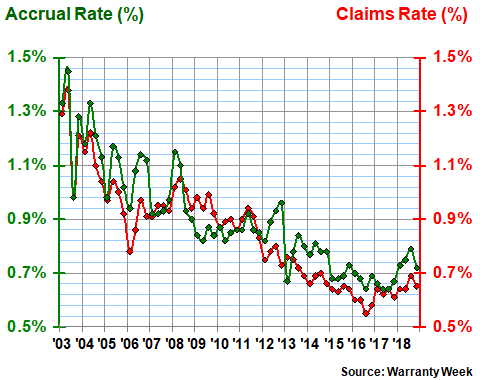 This results in a set of two pairs of percentage rates: the claims and accrual rates for the OEMs (Figure 3) and the claims and accrual rates for the suppliers (Figure 4). Because not every company ends its fiscal year on December 31, and because some companies report warranty data for three-, six-, nine-, and 12-month periods, we are presenting the expense rate data in a quarterly format. This creates a pair of charts that each contain 128 measurements: 64 for the claims rate and 64 for the accrual rate. As is clear from the shape of the pair of lines in Figure 3, the OEMs have continued to reduce their warranty expense rates for the past six years, after seeing them remain more or less the same for most of the previous decade. For instance, Boeing reduced its claims rate from 0.4% at the end of 2017 to 0.3% at the end of 2018, and cut its accrual rate from 0.5% to 0.4% over the same time period. General Dynamics also notched both its expense rates downward, while Textron saw its claims rate rise but cut its accrual rate anyhow. Among suppliers, the expense rate reductions seem to have ended, after falling for much of the 14 years from 2003 until 2016. However, we also note that expense rates rose in 2008 and again in 2012, before resuming their long-term downward trend in the following years. Is that what's happening now? Or is the recent bottom as low as they can go? Time will tell. Suppliers that cut both their claims and accrual rates in 2018 included Ametek Inc., Crane, Honeywell, John Bean Technologies, L-3, and Trimble. Following its major acquisition, United Technologies saw its claims rate rise from 0.5%	to 1.1%, while its accrual rate rose from 0.8% to 1.3%. FLIR, Moog, and Teledyne also saw both expense rates rise last year. Several others saw a mixture, where one expense rate rose while the other fell. Our third warranty metric is the balance reported at the end of each calendar year for the warranty reserve funds of the 10 OEMs and the 90 suppliers. As can be seen in Figure 5, the split for reserves is much closer to even, though the suppliers are still in the lead. Over the past 16 years, the suppliers have accounted for about two-thirds of the industry's claims and accrual totals. In 2018, their share actually approached 75%. However, with reserves, the long-term average split has been closer to 55% suppliers and 45% OEMs, even though their expense rates are similar. 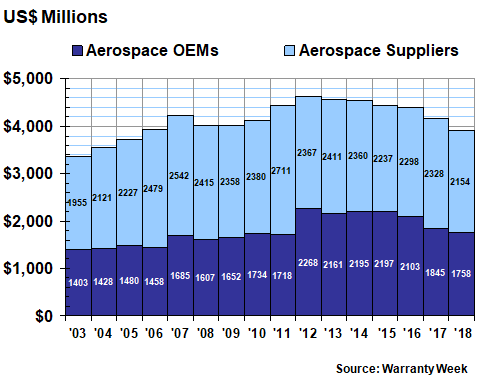 This is likely because the duration of the airframe warranties tends to be much longer than the warranty term for most parts and components. Therefore, the OEMs need to maintain high balances for longer periods. For instance, let's compare the ratio between claims paid and reserves held. For Boeing, that ratio was close to six, meaning that the company kept a reserve balance close to six times what it paid in claims last year. For General Dynamics, the ratio between claims and reserves was close to five. In contrast, Moog was the only large supplier with a ratio over five, and some such as Trimble and Garmin kept their ratio below one. United Technologies' ratio was just under three, and Honeywell was at 1.4. At the time of its acquisition, Rockwell Collins was at 2.2. In other words, all of these companies maintain warranty reserve balances that are relatively smaller than those of the major OEMs, given their recent annual claims payment totals. In Figure 5, the industry's total reserve balance stood at $3.91 billion at the end of 2018, down by $261 million or 6% from the end of 2017. The OEMs reported a decline just under that percentage rate, while the decline for suppliers was just a bit over the industry average. It was the third year in a row that the warranty reserve balance declined for the OEMs, and the sixth year in a row that reserves declined for the industry as a whole. And it was only the second time that reserves declined for both groups in the same year (the other was 2007-2008). Honeywell led the declines last year, cutting its warranty reserve balance from $408 million at the end of 2017 to $310 million at the end of 2018. Trimble, Moog, L-3 Technologies, Textron, and Boeing each reported proportionally smaller reductions in their warranty reserve balances. At the other extreme, United Technologies led the warranty reserve increases, adding $125 million to its balance and thereby widening its lead over Boeing (which reduced its balance by $84 million). Among all U.S.-based manufacturers, only nine companies maintain a warranty reserve balance in excess of $1 billion. United Technologies is in seventh place with a balance of $1.449 billion. Boeing is in ninth place with a balance of $1.127 billion. Elsewhere, the warranty reserve increases were much smaller. General Dynamics, for instance, boosted its balance by $13 million, a 3% increase. Woodward Inc. added $7.1 million. Crane added $3.6 million. And Garmin added $1.4 million to its balance. Next week, we will begin a detailed look at warranty expenses within the automotive industry. And in subsequent newsletters, we will take a look at all of the remaining product warranty expense-producing industries, including those in the high-tech electronics sector and those in the building trades. TV troubleshooter helps woman get VSC refund from Vehicle Solutions.